Regarded as the legendary surf and skateboard shaper, Jeff Ho is much more. He became popular in 1960’s and 1970’s because of his revolutionary approach of painting surfboards in vibrant and lively colors. The Californian artist has his own unique view on art and artistic process itself, which in some cases is quite different than other’s conceptions. Ho’s abstract and graffiti style canvases and paintings are permeated with minimalist compositions, graphic lettering, and symbolism. The entire creative surrounding around Jeff can be described as chaotic, thanks to the experimental spirit and boldness that inspired him to push the borders of the everyday routine. The creation of Jeff’s first skateboard at the age of 8 and the first surfboard at the age of 14 marked the beginning of an amazing journey for this Venice-based artist. During the 1960’s he started to design and build custom-made longboards that would perform to his high standards. His first company called Jeff Ho Surfboards sponsored a team of surfers. A decade later the author founded Zephyr Productions – a retail and manufacturing shop, also known as “Dogtown”, in regard to the neighborhood which spread over the south side of Santa Monica, Ocean Park, and Venice. 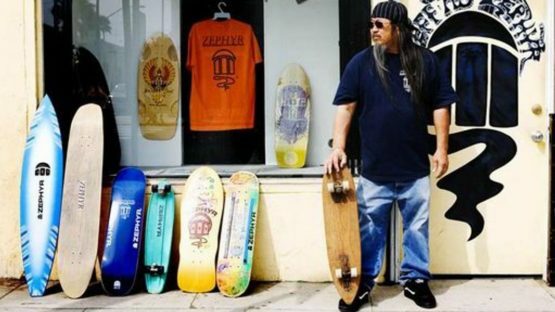 Alongside these projects, he also created the Zephyr Competition Team, consisted of skate legends such as Jay Adams, Stacy Peralta and Tony Alva, who became famous as the Z-Boys. In 2001 the documentary movie “Dogtown and Z-Boys” , directed by Stacy Peralta, got awarded for exploring skateboarding. 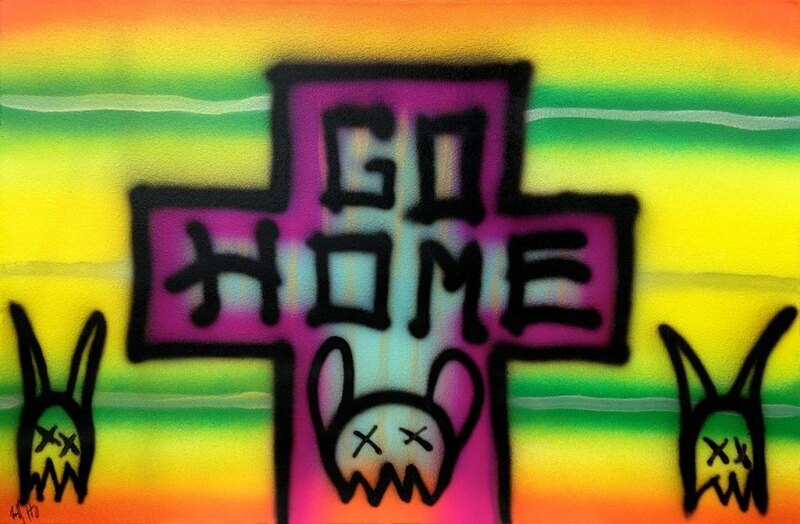 As a true pioneer and creative visionary, Ho has always supported the freedom of expression, whether in surfing or skating, and this philosophy is present everywhere, especially in his visual artworks. Recently Jeff has decided to transfer his iconic imagery to canvases, not letting to be limited to only a few mediums. Ho’s intimate relation to his surrounding is highly noticeable, having in mind that most of his paintings and earlier works are somehow connected to California. 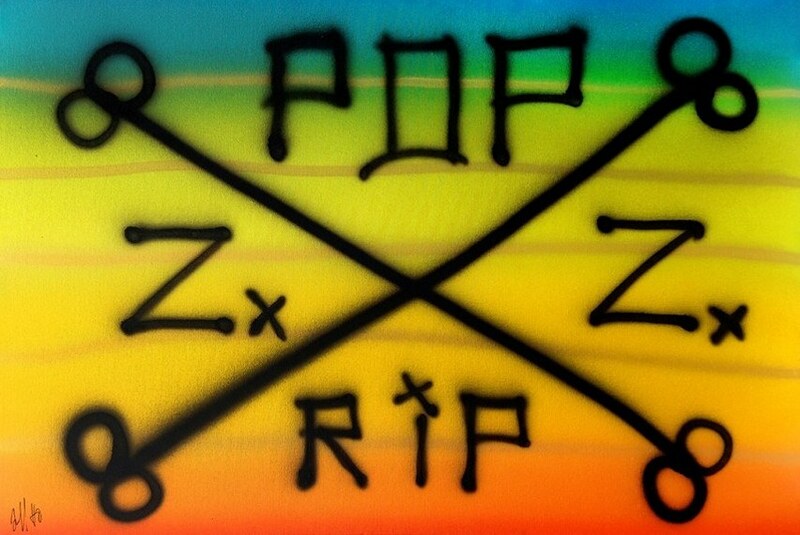 In his solo exhibition No Posers from 2015, the artist brings freshness and joy through graffiti style that reminds of the P.O.P. 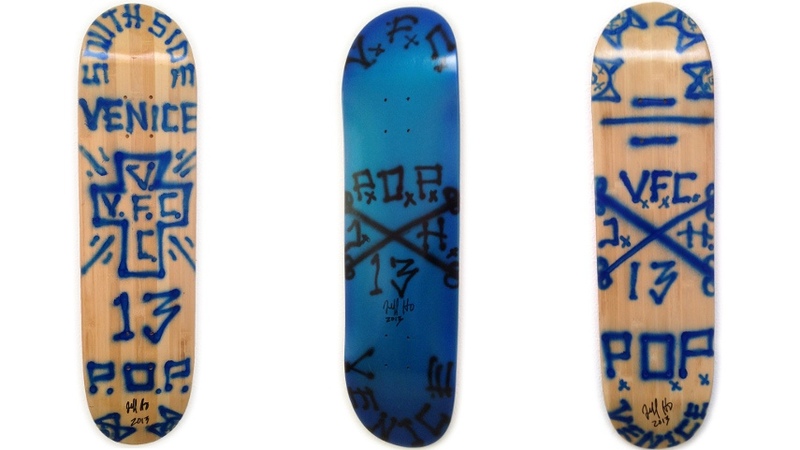 skate era and Zephyr rainbow artworks. The traditional way of using color where everything is flawless, every line, shade, and spot are perfect, smooth, constant, and sharp- is all gone. Jeff thinks outside the box and acts contrary to the textbook rules. In more than half a century long career, the artist has created thousands of high performance, highly wanted surfboards, canvases embellished with aerosol cans, as well as skateboards. Jeff’s ingenuity amazes viewers in cities around the world. His artworks were exhibited at numerous galleries and festivals. Jeff Ho lives and works in Venice, California.